After 6pm there are fewer cars on the road, and after 7.30pm, many of the heritage buildings are beautifully illuminated. Once a month, there is a guided walking tour of George Town on Friday evening (see below), but on the other 30 or so evenings of the month, it is perfectly possible to guide yourself. Grab a map from the Tourist Information Centre on Beach Street and start discovering. These traditional Penang water villages, where the stevedores and coolies built their homes, on the jetties on which they worked in the late 19th and early 20th centuries can be quite crowded during the day, but are delightful to visit in the early evening. The well-known Chew Jetty is open to visitors until 9pm, but the Lee Jetty and its colourful illuminations welcomes visitors even later, and offers a breezy pier for the weary to sit down, relax, and watch the evening activities at the Penang harbour. 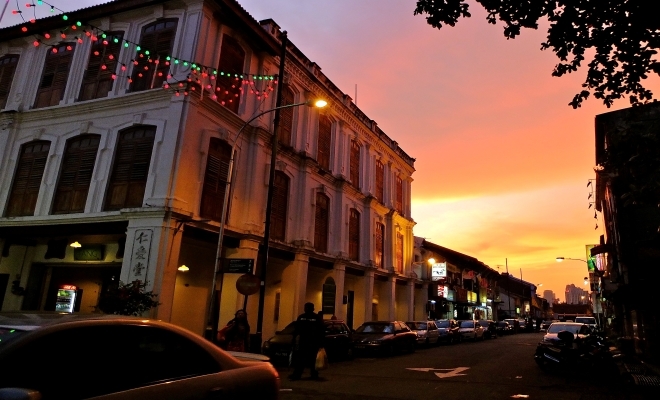 This vibrant area of George Town, around Queen Street, Chulia Street and Market Street is illuminated by lights in the evening, and the music shops continue to blare Bollywood hits into the streets until late at night. Many of the saree shops remain open until late, and you’ll find places to sit on the street to enjoy Chapati and curry while people watching and soaking in the atmosphere. 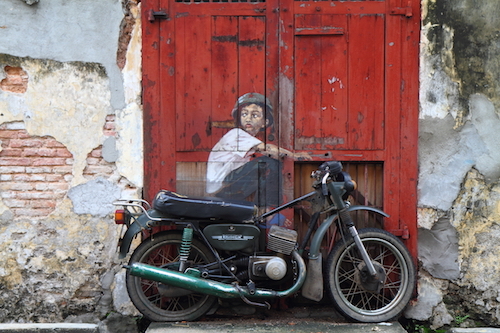 The sun doesn’t set until about 7.30pm, and the cooler early evening hours are a perfect time to take a look at Penang’s famous street art in a less hot and crowded environment. You may refer to the street art map for getting around. The ever-popular night markets are worth exploring in search of souvenirs and bargains. Most offer street food, affordable clothes, and accessories. Macallum Street Night Market at Lintang Macallum 1, off Weld Quay, is open every Monday and Thursday, from 7pm until 11pm. 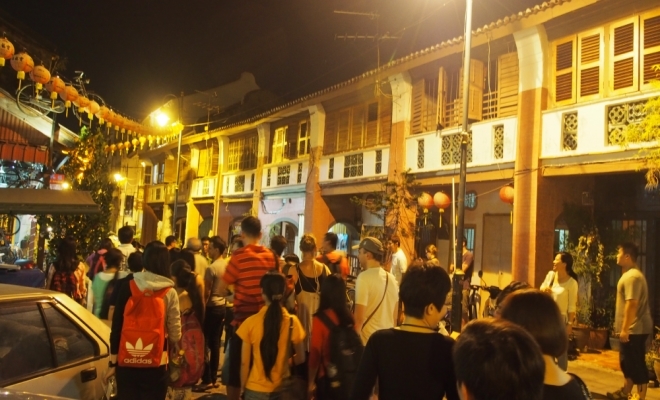 Tanjung Bungah Night Market is on Tuesday nights from 6.30pm to 9.30pm at Jalan Sungai Kelian. 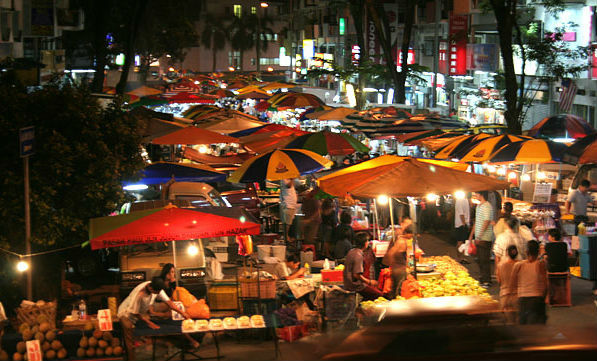 The largest of all is the Batu Feringghi Night Market, which operates daily from 7pm. 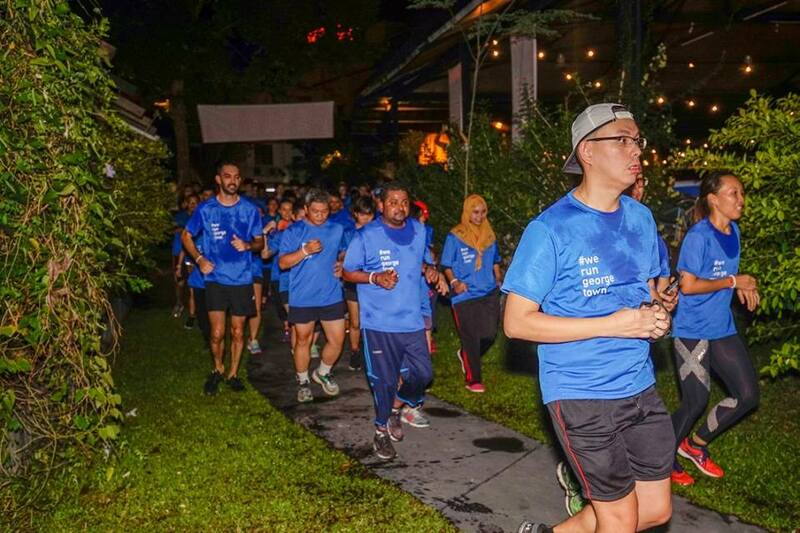 An entirely different way to experience Penang at night is to join a running group. We Run George Town is a small collective that runs as a group to not only promote the great benefits of exercise but also to promote the awareness of the city. They run every Thursday night, meeting at the Hin Bus Depot on Jalan Gurdwara at 8:15pm to warm up and then run together until about 9:30pm. 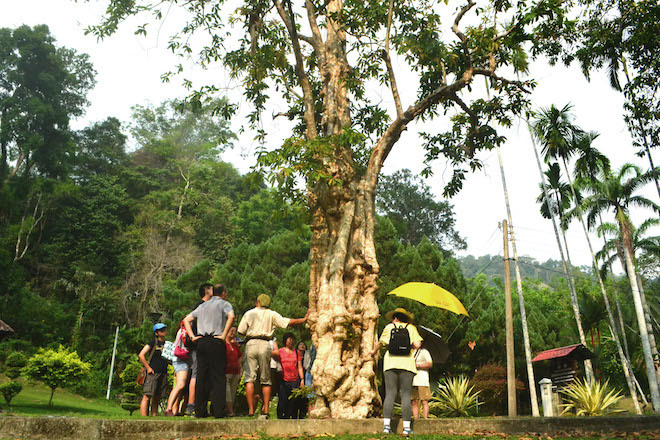 There are also several hash groups that run various routes through the hills of Penang. For example Penang Hash House Harriers meets on Mondays at 6pm, but they do charge RM20 for guests to cover refreshments. 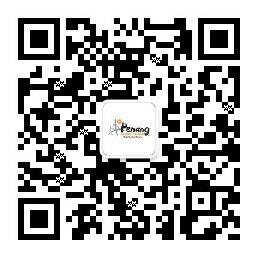 You can reach them at info@penang.hash.com.my. Similarly the Hash House Harriets run on Thursdays and charge a RM10 guest fee. The beautiful landscaped gardens, encircled by jungle-clad hills, are a relaxing and healthy way to pass an hour or two. Here you can experience Penang’s natural heritage, with endemic plants such as the Pinang Palm (Areca catechu) that gave its name to the island of Penang, the slipper orchid and the ginger, as well as non-native tropical plants such as the black lily and the unmistakable cannon ball tree. You will almost certainly see macaques, and possibly the shy dusky leaf monkeys. The Botanic Gardens are open until 8pm, and are found at the end of Jalan Kebun Bunga. This unique contemporary art space, in a partially renovated art-deco building showcases progressive artists, artworks and art forms within its enchanting space. There is almost always an exhibition in progress, and the creative murals in the grounds are always on view. It is open until 8pm on weekdays and until 9pm at the weekend. Hin Bus Depot is located at 31a Jalan Gurdwara and is open Monday to Friday 12pm until 8pm, Saturday and Sunday 11am until 9pm. 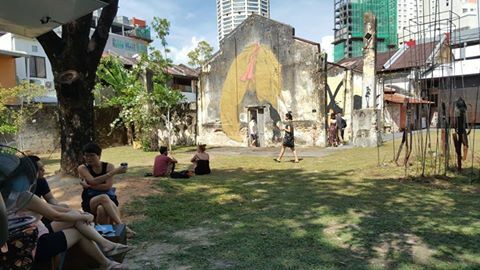 Hin Bus Depot puts on outdoor film screenings on the first and third Tuesdays of the month at 8pm, and Luma (37, Jalan Kampung Jawa Lama) shows a film followed by a discussion on the 3rd Friday of the month. Penang’s performing arts centre, penangpac, at Straits Quay, screens films on a different theme each month, Tuesday to Friday, usually during the second week of the month. The Alliance Francaise and the Malaysian-German Society show French and German films respectively occasionally at their premises. The Central Area Transit (CAT) is a free shuttle bus service that follows a circular route, beginning and ending at the Weld Quay Bus Terminal. 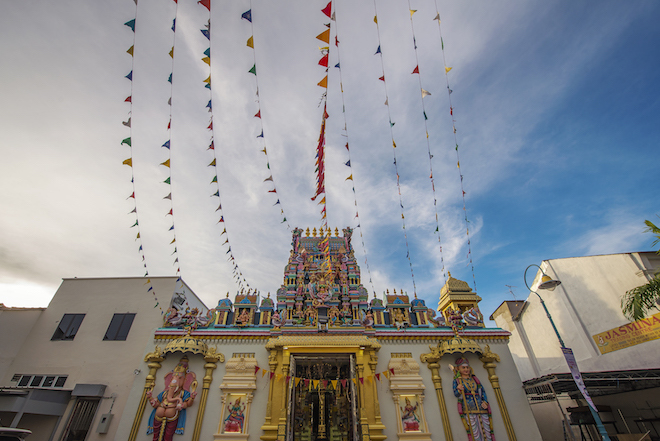 It travels along the major streets of George Town and there are stops that are convenient for all of the activities listed above, with the exception of the Botanic Gardens. The buses run every 20-30 minutes until midnight.